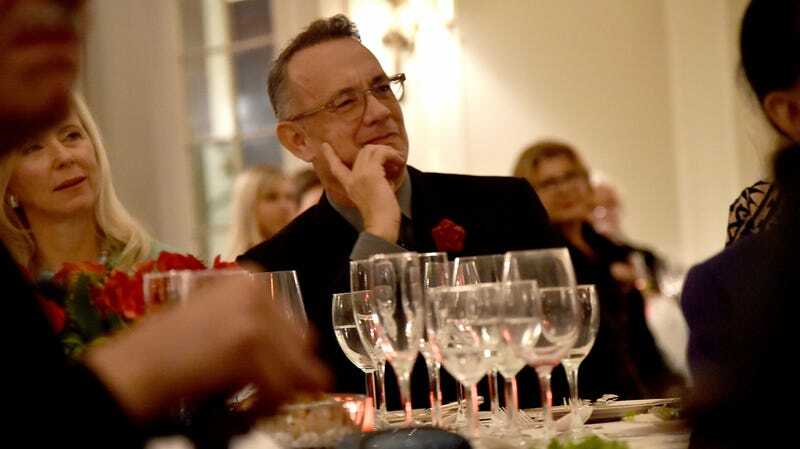 Tom Hanks at the 2018 American Friends of Blerancourt Dinner in November 2018. Tom Hanks is in New Mexico filming a sci-fi movie called Bios and tweeting repeatedly about lost gloves. He’s also completely enraptured the locals, who apparently will not even let him eat a steak dinner in peace. Per news station KRQE, while Hanks dined at Ruth’s Chris Steakhouse on Saturday, several tables attempted to take covert selfies with him in the background. You can imagine how entirely not-covert this looked. One woman at the table adjacent to his took it even further: She began dropping loud hints that it was her birthday, and it would be JUST WONDERFUL IF TOM HANKS WOULD SING TO HER. Hanks heard her—probably because she was scream-whispering—and offered to sing to her even though her birthday dessert hadn’t yet arrived. The woman, who is married with a son, described it as “probably the best 12 seconds of my life.” She also tells KRQE that she was “sweaty and couldn’t even concentrate” with Hanks near her. He actually looks like a pretty good sport in the video, honestly.